A competitive water game that includes cowboy theme and interactive targets. Both players shoot the wheel targets in order to advance their bull forward. 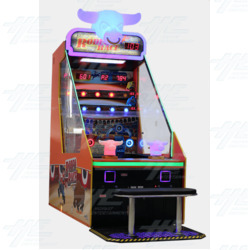 Shooting the lit up targets around the wheel adds speed to the player’s bull. First to the finish line wins! The game includes bright translucent marquee and controllers to attract more visitors to its location.